Live the life you've always wanted to live! 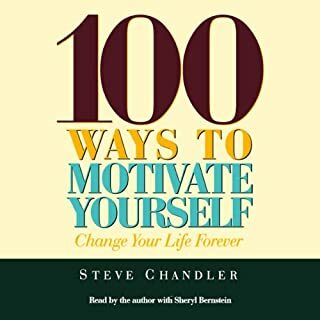 100 Ways to Motivate Yourself is packed with techniques for breaking down negative barriers and pessimistic thoughts that prevent you from fulfilling your goals and dreams. It's easy to get stuck in a humdrum life and only fantasize about what "could have been". Motivational speaker Steve Chandler helps you change that way of thinking to what "will be". His ideas will help you create an action plan for living out your vision. I find the "boring" narrative very refreshing. I am listening to the audible version of this book as I write this. Contrary to some other reviews, I find the boring, blah...whatever you want to call it. But, I have been pretty unmotivated for a while since a breakup from a long relationship. I've listened to so many audible books with people who sounded like they were SO upbeat...but it sounded false to me. I didn't want someone on the other end to try and inspire me with all the "hype", excited sounding voice.....and so on. I'm already feeling that this audible book IS going to motivate me...or I should say, help ME to motivate MYSELF. It's helping me see I don't need these "get over your breakup" books; I just need to get motivated to begin a new future and the only one who can do that is ME. One thing among many that has helped me see some things that are holding me back is "turn off the TV"...I've been "hiding" in mindless TV for a while now...it's NOT going to be turned on today. I've already been motivated by several suggestions and I have not even finished listening to this book. I love it that he is not "acting" excited, sounding so "upbeat" that it makes me want to stop listening before I finish...he's just speaks in a matter-of-fact sort of way and I find it very easy to listen and take his suggestions to heart. I also love the fact that he doesn't have any psychological "babble" inserted, no history of how psychologists have discovered WHY I'm not motivated. I didn't want to hear any of that...I've heard it all before and I just don't care. I just wanted suggestions...and that's what he gives....#1 through #100 and he explains in a short manner ways to put that suggestion into action. I'm going to be listening to this one over and over and over and....well, you get the idea. I highly recommend this to anyone who wants WAYS to get motivated without any mindless psychobabble. It's easy to feel at home in Mitford. In these high, green hills, the air is pure, the village is charming, and the people are generally lovable. Yet Father Tim, the bachelor rector, wants something more. Enter a dog the size of a sofa who moves in and won't go away. Add an attractive neighbor who begins wearing a path through the hedge. Now, stir in a lovable but unloved boy, a mystifying jewel theft, and a secret that's 60 years old. 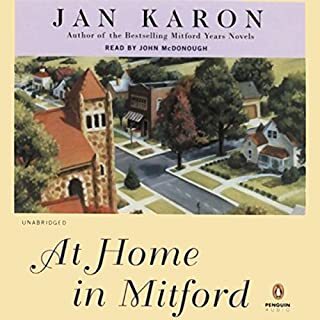 The Mitford Series books are those I want to read over and over. I'd give each in the series 10 stars if possible. I love them because it's like reading about old friends and 'going home', even if you never had a home like that, you'd want one. The stories are funny, some suspense, mystery and everything else a good book has. You can get lost in them and feel like you are right there in Mitford. And, for some reason, while reading these books, they give you a comforting and peaceful feeling...I just feel good when reading them and after reading them. These people are ones you want to know and hope really exist someplace, somewhere. I'd recommend them to anyone who loves reading about small town life, feeling you know the people you're reading about, and like the comfort you can get when reading a good book. I just LOVE the series.